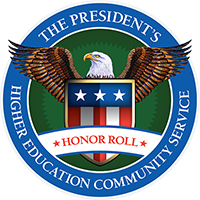 Lawrence Technological University has once again been named to the President’s Higher Education Community Service Honor Roll, which recognizes institutions of higher education that support exemplary community service programs for students and raise the visibility of effective practices in campus community partnerships. The Corporation for National & Community Service has administered the award since 2006 in collaboration with the U.S. Department of Education and the U.S. Department of Housing and Urban Development, as well as the American Council on Education, Campus Compact, and the Interfaith Youth Core. Tree planting for the Greening of Detroit, 70 students, a total of 219 hours. Matrix Human Services, maintenance projects, 80 students, 255 hours. South Oakland Shelter, processing donations, 14 students, 48 hours. Lawrence Tech has distinguished itself as one of the first universities in the country providing leadership education for all of its undergraduates. Lawrence Tech’s Leadership Program covers all four years and includes a commitment to community service and volunteering. Lawrence Tech develops its students as “leaders in the making,” and the leadership program includes service learning for all undergraduates. LTU students take courses and participate in leadership experiences during each year as part of their graduation requirements. The main leadership courses support and are supported by the core curriculum and the courses offered in individual majors. This comprehensive leadership education not only gives students insight into and opportunities for leadership development, it reinforces the development of critical thinking, teamwork, communication, sustainability, and positive change. “We work to ensure all students develop their leadership skills and service experience with an emphasis on character, integrity, and professionalism,” said LTU Assistant Provost Jim Jolly. The 2014 Honor Roll for community service can be found at http://www.nationalservice.gov/special-initiatives/honor-roll.